A company data loss incident today is akin to a fire taking out every single paper file a company stored in cabinets a century ago. Today’s businesses largely use digital files that store customer records, company accounting files, employee records, all their marketing assets, and more. Data loss is a serious problem when it happens to companies of any size, and especially small businesses. Approximately 60% of small businesses go out of business 6 months after a data loss incident, and 72% of them close their doors within 24 months. With companies having to pay a severe price when their data is lost or compromised, backup strategies really should be the most important part of any technology infrastructure. Yet, when we’re assisting small businesses in Singapore with more efficient operations through managed IT services, we find that many are not properly backing up their data. They’re either backing up on one type of media only or using a local backup that’s on-site, but not saving data off-site. In this day and age of cyberthreats around every corner and the increase of attacks like ransomware, which is designed specifically to “steal” your data and request a ransom, small businesses really need to up their game when it comes to backup strategies. Is your company’s backup sufficiently protecting you from a major data loss incident? We’ll discuss ways you can securely store your digital files to ensure they’re recoverable when you need them. What are the Major Causes of Data Loss? Hackers and data breaches aren’t the only cause of data loss, there are multiple ways out there that a company can suffer loss of their digital files. And beyond the impact on their day-to-day operations, the cost per lost file can financially cripple a company. If you have just 1,000 files on a desktop computer or server that is hit by ransomware, the cost would be approximately $158,000 for those lost or damaged files. Unfortunately, data backup is easy to forget about when there are other urgent business needs. Companies tend to turn on a backup system and then forget about it, until they need it. And unfortunately, that can leave them without their safety net if something went wrong. There are backup best practices that can save you from suffering a data loss incident that might mean the end of your small business. When our ManagedIT team is working with clients on managed data backup, we are strong advocates of proper data backup and using best practices to secure your files in the event of a catastrophe, which ensures your business continues with the data you need. Here are key backup strategies that are vital for proper data backup and recovery. Saving your data on just one local backup can leave you without your files in the case of a fire or hardware malfunction. If you’re relying on just one on-site server or hard drive to host all your desktop and mobile backups, in the event of a location-based disaster (flood, fire, tornado), you could end up losing everything, including that local backup. If you’re relying on just one system (whether local or cloud) to hold all your data, if something goes wrong or there is a hardware malfunction, you could end up losing all your files, even though you thought they were safe and recoverable. 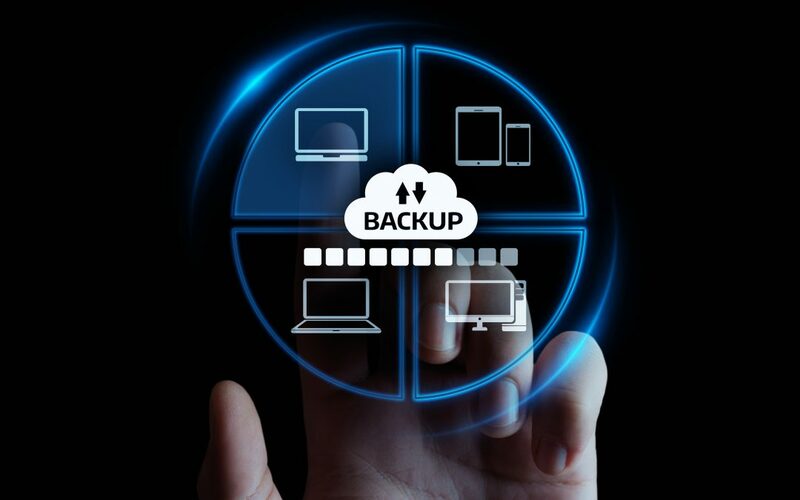 The best strategy is a redundant backup plan that includes backing up data to more than one type of media, such as a local backup to an external hard drive or server AND a remote cloud-based backup. That way you’re covered completely. While it’s vital to back up on more than one storage media, it’s also important that one of them isn’t located on your premises. Cloud-based backups are especially resilient and make data easily recoverable because they can be accessed from any internet connected device. We’re used to having data encrypted when it’s being transferred from a device to or from a backup system, but once it’s in place on the storage media, it’s considered “at rest.” This is a prime target of hackers counting on there being less encryption to have to get through, which is why using a system that encrypts data at rest is important. Image-based backup creates a full copy of the operating system and everything associated with it, such as the device’s software, application configurations, and files. This offers fuller protection and ability to restore your devices completely because rather than just saving your files, it’s taking a full snapshot of your computer that can restore everything on it if needed. Contact ManagedIT for Backup Strategies that Work! Data backup should be something that provides your small business with a safety net and peace of mind, and if set up correctly a good backup plan can quickly restore your office in the event of a data loss incident. Let us help you put data backup best practices in place today! Call us to schedule a free consult at +65 6748 8776 or reach out online.